COP24 Climate Summit .. Why Am I Here?? Katowice, Poland ... I’ve been at COP21 for nearly two weeks and will be heading home soon. I’ve been asked by friends back in California what it’s like and why I’m spending so much time here. COP24 is my fourth COP climate summit. My first was the landmark COP21 in Paris in 2015. The setting is Polish coal country. The host town of Katowice was a major coal producer until their mine closed down around 2001. All that’s left of the mine is a museum where you can descend into the old shaft and see what it was like for the miners who supplied the energy source that made modern Poland possible. The COP24 meeting site is centered around a futuristic arena with a look somewhat like the Starship Enterprise on top of the reclaimed coal mine. Though this locality is making the transition away from coal and is proud of their newer tourism and service industries, the greater region still relies on coal. On the way from my AirBNB to the venue every day, I pass over a railroad track where I can see a line-up of coal-laden railway cars heading to a nearby powerplant. Poland gets a significant portion (about 80%) of their power from coal and their government, despite hosting the climate summit, expects a much-too-slow transition to other power sources. Poland plans to reduce their coal power generation to around 60% by 2030. Over 22,000 participants from governments, research institutions, media, non-governmental organizations and many others have travelled to southern Poland for many climate reasons. 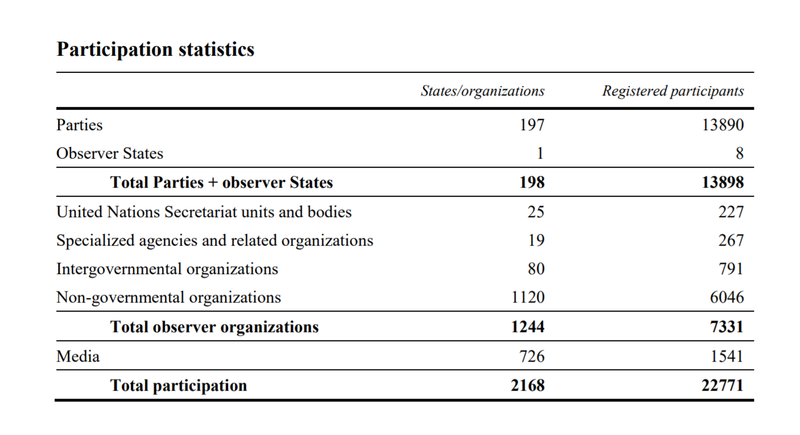 The statistics below show nearly 14,000 representatives of 198 governments are here. This is somewhat deceiving as country delegations have many guests. Participants have many reasons for coming to a COP. Government ministers and their staff negotiate the minute details of the climate agreements and implementation documents. Scientist present their latest findings. Governments and some organizations showcase their climate work and hold seminars in their “pavilions.” Non-governmental organizations try to influence the proceedings, connect with partners around the world, hold media events, or otherwise try to impact global climate efforts. At the COP, there are large meetings of country representatives to review and approve the latest agreements and documents that govern the implementation of the Paris Agreement and related agreements. These aren’t developed in a vacuum. Rather, they are discussed, reviewed and dissected at seemingly endless meetings of “subsidiary bodies” and other groups of government representatives. 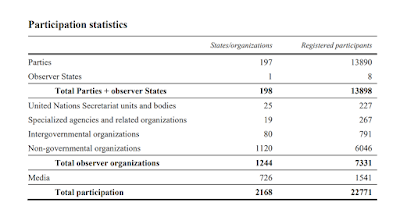 Most of these are open and many of the non-government participants monitor and attempt to influence these proceedings. Single words can cause great debate. An extreme example occurred when the US (i.e. Trump Administration) aligned itself with Russia, Saudi Arabia and Kuwait to object to the submission of a scientific report. At COP21, governments asked their scientific advisory body to work with the leading scientists of the world to report back on the potential and implications of limiting global warming to 1.5 degrees centigrade. That report was submitted in time for COP24 and it paints a stark picture of carbon emissions, calling for a very quick reduction and ultimately net-zero level of carbon emissions. An innocuous resolution to “welcome” the findings of this report was objected to by the four countries, including the US. They would rather just acknowledge that the report exists than give credence to the findings. They are pushing for language to “take note” of the work of the scientists rather than welcome the findings. In a statement, the US said, “the United States was willing to note the report and express appreciation to the scientists who developed it, but not to welcome it, as that would denote endorsement of the report." The US isn’t winning any friends here as it as it moves towards the Trump-imposed withdrawal from the COP proceedings in 2020. A side note on all of this … there are two groups of US representatives at the COP, the policy and political folks from the Department of Energy, State Department and elsewhere. There are also career State Department employees who know how to professionally handle international relations. I am told the career folks are handling their tasks honorably and should the US re-engage on climate issues, will be welcomed back into the process. For many of us the discussions among the country representatives are a small portion of what’s going on. At any time, there are several dozen “side events.” There are so many side events, that it can be a major challenge discovering which ones may be of interest. I attend these side events for several reasons, including connecting with new and old acquaintances, learning the latest in areas of interest, and supporting people I know who have organized or are speaking at the events. There are also regular press conferences and some of the groups I’m involved with use these to convey information about the COP process or broader climate related information. The UN makes footage of these press conferences available online. An example of one I assisted with is here. Acronyms abound at the COP, starting with “COP” itself (Conference of the Parties of the UNFCCC (United Nations Framework Convention on Climate Change). LGMA is a Local Government and Municipal Authority. Youth participate as YOUNGOs (Youth Non-Governmental Organizations). Academic and other research entities are RINGOs (Research and Independent Non-Governmental Organizations). Business groups are part of the BINGO group (Business and Industry Non-Governmental Organizations). The list goes on and on for both participants and what they’re talking about. In the COP context, NAPA is not a wine growing region .. it is a “National Adaptation Program of Action.” A LEG is not a body part. Rather, it is the “Least Developed Countries Expert Group.” The UNFCCC has a long glossary of acronyms and terms for the acronym-confused (here) like me. The list even includes “NN” for “Not Named.” No further explanation of NN is given. I’m here with a few organizations. I’ve been a long-time Board Member of the InterEnvironment Institute, a California based public policy center that works on a variety of internationally important environmental issues, including natural areas within or contiguous to urban centers, connecting conservation areas and environmental programs to museums and other partners, and collaborative problem solving. Thanks to the accreditation the Institute enjoys with the Unite Nations, I am able to obtain the necessary credentials to enter the main venue of the COP. I’m also on the Board of Solar Cookers International (SCI), an organization that promotes human and environmental health through support of carbon-free solar cooking. Last year, I helped introduce SCI to COP and it has turned out to be a very useful venue to promote solar cooking. We analyzed all of the country-specific climate plans and found that few mention cooking as an issue and even fewer mention solar cooking (see analysis here). Because SCI has an affiliate in England, the UK government allowed us to display a solar cooker and use their pavilion space to meet with interested people for the first week of the COP (it lasts two weeks). Our display was in one of the busiest areas of the facility and were in constant conversation with country representatives and others interested in deploying more solar cookers in their region, especially in Africa and south Asia. For the second week, SCI has booth space for similar interactions with participants. The connections are significant. As I write this, SCI staff is preparing to attend a dinner with Nepal government representatives, have their third press conference and consider invitations to consult with several African and south Asian countries on improving solar cooker deployment. The other organization I work with is the Climate Bonds Initiative (CBI). CBI promotes the use of green bonds for infrastructure and other projects. I worked on green bonds when I was with the California Treasurer and I continue to believe they offer a necessary framework for funding infrastructure and other projects. The specific effort I’m working on is to promote the Green Bond Pledge. At COP24, I’m participating in finance related side events about green bonds and meeting local government officials and others to promote the pledge and other green bond work. I even met with two California legislators at COP24 to brief them on how the green bond market could expand with California leadership. I attended several sessions with the scientists working on climate issues. I’ve done this at every COP to improve my understanding of what we truly know about climate change. The mood of the scientists feels much different than prior COPs. They are more direct, more specific and seem much more scared about what they are conveying. They know sea level is rising, temperatures are rising and extreme weather events are getting worse. They’re telling us that we have 12 years to dramatically reduce carbon emissions ratcheting up quickly to get to a 50% reduction in emissions. We then have until 2050 to get to net-zero carbon emissions. In 2018, worldwide carbon emissions actually INCREASED. There’s even quiet talk of a “runaway climate change” scenario if we don’t get emissions under control soon. As I walk the halls of COP24, I proudly wear my California flag pin. I don’t agree with the climate policies of our national government (an understatement!!) and the world is moving much too slowly on this existential threat. But I’m happy to be among those from US state and national governments that are “still in” and showing how to move forward with policies that take us towards climate solutions. As California Air Resources Board Chair Mary Nichols told those gathered here, when we’ve set ambitious clean energy and clean air goals we’ve met them faster cheaper and less painfully than expected. So, why am I here? To connect, to learn, to assist and hopefully to make a little contribution to the efforts to slow climate change. Katowice, Poland – Scientists have spent the three years since COP21 refining and reviewing data, observations and studies. And since COP21 in Paris, they’ve learned to convey their findings in the clear language policymakers can understand, even preparing a special report directed at policymakers (copy here). This is the fourth COP I’ve attended. The sense of urgency the scientists are conveying cannot be understated. They know what’s happening, they’re scared, and the want policymakers to take steps now to stop the worst effects of climate change. Dr. Elena Manaenkova of the World Meteorological Organization also advises the climate policymakers. She said the latest findings show that the hottest four years on record are the past four years (including 2018). She also said that the current average global warming of about 1 degree centigrade is not uniform throughout the world. The Arctic is warming at a rate of about five times faster than the rest of the earth and many land areas are also warming faster than the average. Those of us from California know first hand the impacts that are already here. Our recent fires destroyed lives, displaces thousands of people from their homes and caused smoke-related health impacts throughout the state. Last month, my family wore uncomfortable breathing masks for a time in order to safely go outdoors. California is clearly not alone. Island nations face special concerns from sea level rise. Other areas are facing increased hurricane and storm risk. The heat, drought, water supply and other impacts California faces are similar to those faces by similar Mediterranean type climate zones. There are five Mediterranean climate zones in the world, including California/northern Baha, Central Peru, southern & southwest Australia, South Africa Western Cape and the Mediterranean Basin area. One of the COP24 workshops I attended focused on how to adjust within these climate zones. Laurel Hunt of the Los Angeles Regional Collaborative described how her team is working with the policymakers in her region to develop a sustainability plan to address the direct and indirect impacts of climate change, including energy, transportation, public health, water and housing. Los Angeles is embarking on an unprecedented public collaboration process to engage the citizenry in understanding and developing solutions. Tropical and other vector-borne diseases are on the increase in Mediterranean climate regions. West Nile Virus is on the increase in these areas. Dr. Orna Matzner, a science advisor to the government of Israel described how a recent outbreak of Leptospirosis could be traced back to public exposure in rivers and streams. Those water bodies had an increase in stagnant areas caused by lower water flows and drought conditions. Alon Zask of the Israel Ministry for Environmental Protection described how a future water strategy should rely on a combination of steps, including pollution prevention, wastewater treatment and desalination. He said that “In Israel, sewage is a water source.” He also said that more than 50% of water used in Israel is now “manufactured” from desalination facilities. “If we’re talking about adaptation, this is adaptation. Geoffrey Danker of Sempra Utilities in California described how they are now addressing both the transition to renewable energy and adaptation of their infrastructure to current and future climate impacts. They are already protecting low-lying facilities from sea level rise, addressing fire impacts, and taking other steps. Together with other utilities, they evaluate and learn lessons from every extreme weather or fire disaster. “The really depressing thing is that every time we get together to evaluate one disaster,” he said, another new disaster that has come along in the meantime. Dr. Jordan Harris of Adapt Chile said his country has faced severe fires and droughts as have other similar Mediterranean regions. He summed up the situation for these regions, saying they have become a “climate laboratory” as more and more climate events affect their country. COP24, Katowice, Poland – This is my fourth COP. My first was COP21 in Paris where the international agreements to address climate change finally formalized. People came away energized and feeling that as countries submitted their plans for climate solutions, we’d truly be on a right path to resolving the climate crisis. By my third COP in Bonn, Germany last year, there was a wide recognition that all the country commitments were not enough to avoid catastrophic climate change, but there was hope that countries would start to move more aggressively to curtail fossil fuel use and other greenhouse gas contributors. The scientists are telling us that we should limit earth temperature increases to 1.5 degrees centigrade and that if it goes above 2 degrees, our troubles will escalate rapidly. Even if we limit our temperature increases, we’ll still see many impacts, including sea level rise, more extreme weather events, drought and health impacts. At higher levels, the habitability of large areas of our planet will come into question. The sense of urgency is clearly prevalent at COP24, but so is a sense that many governments are saying the right things at these sessions, then failing to make the changes necessary to curtail fossil fuels quickly enough. Most countries agree there is a problem and are increasing renewable energy. But many countries are then continuing to use or even expand the use of coal and other fossil fuels. Not enough governments are providing the needed climate leadership and some such as the US national government are overtly backsliding in climate commitments. Leading means more than talking, said Dr. Gale Tracy Christiane Rigobert, Saint Lucian Minister for Education, Innovation, Gender Relations and Sustainable Development at an event I attended today. We need to be sure these “events as ‘talkshops’ will end with COP24,” she said. Though Poland is hosting COP24, the government is among those that cling to archaic energy sources. New coal projects are still proposed, even though many workers in the coal industry are pushing for a faster transition to clean energy jobs. What should come out of this COP to get us on the right path? Mr. Pulgar-Vidal, along with many others, are saying that the existing system of country promises isn’t enough and that there needs to be a clearer set of rules for how countries evaluate their emissions and commit to solutions. There is some hope that a framework for these rules will emerge during COP24, to be finalized in time for renewed country commitments and actions by 2020. We’ll see in the next few days if an action path is agreed to by the gathered governments (absent the commitment of the current US national government, of course). Let’s hope that the real world and real leaders take the real action steps we need.